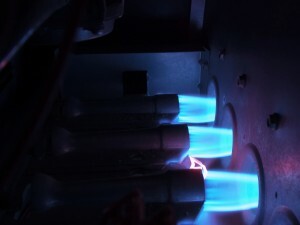 What Is Gas Furnace Short-Cycling? Short-cycling is a malfunction in a furnace where the furnace turns on and off repeatedly. A thermostat calls for heat, and the gas furnace turns on to meet that request. However, after only a few minutes—usually less than five—the furnace turns back off before it can provide the necessary heat. A short time later, as the temperature drops, the thermostat makes the request again, and the furnace starts up… and the process repeats over and over again, several times an hour. It forces the furnace to work harder, since the start-up cycle drains the most power of any part of the heating process. This will raise utility bills. The additional strain will cause the furnace to wear down faster, leading to multiple repairs and an early replacement. The furnace will not stay on long enough to properly distribute heat around a home. You might have noticed in the description above places where a malfunction could trigger short-cycling. Is it something wrong with the thermostat? Is the problem in the furnace itself? Is the house losing heat too fast? Thermostat trouble: The thermostat might be incorrectly placed in the house so its picking up colder temperatures, such as from a drafty window. The thermostat might be malfunctioning and reading incorrect temperatures. Closed or blocked vents: Vents that are shut or blocked with furniture will tra too much heat in the furnace, causing the limit switch to kick in and shut the furnace off. Broken components: The problem might be with the limit switch itself, or other components in the furnace like the pressure switch. These problems must have the service of a professional to repair. Oversized furnace: If the furnace is a new one, the issue might be that the furnace is too powerful for the house. It’s raising the temperature too fast and causing the thermostat to think it’s finished its job. A moderately oversized furnace can be adjusted down by professionals. A largely oversized furnace will need to be replaced. Never hesitate to call us for help when you have a short-cycling furnace and you can’t solve the trouble by opening vents or changing the filter. It’s our job to see you have your warm household restored. Oasis Heating, A/C & Refrigeration is a family owned and operated company delivering quality to Northern Virginia since 1998.